MANILA, Philippines - The November 2017 nurse licensure examination (NLE) or nursing board exam top 10 or topnotchers including the other results - list of passers, top performing schools and performance of schools are released online on December 12, or in 11 working days after the exam. Raymund Kernell Balmaceda Mañago from the University of the Philippines (UP) - Manila topped the board with 89.00%. It was followed by Veronica Louise Ganalon Necor of University of Santo Tomas (UST) WITH 88.80%. 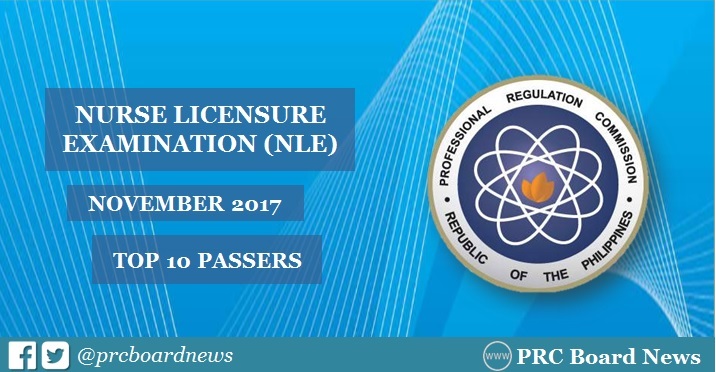 The Professional Regulation Commission (PRC) administered the NLE on November 25 and 26, 2017 in Manila, all regional offices nationwide (Baguio, Cagayan De Oro, Cebu, Davao, Iloilo, Legazpi, Lucena, Pagadian, Tacloban, Tuguegarao) and Zamboanga. In the November 2016 NLE, PRC recognized 59 topnotchers who occupied the top 10 list. Eric Carolino Jacinto from Saint Louis University (SLU) and Faith Calzado Rutagines of University of Santo (UST) topped the board exam garnering identical grade of 86.60%. In the November 2015 NLE, there were 94 topnotchers in the list. Alyssa Claire Anguren Almo of Remedios T. Romualdez Medical Foundation (RTRMF), Suha Canlas Hassan Magdy Mohammed Ibrahim of Pamantasan ng Lungsod ng Maynila (PLM) and Alyssa May Bringas Madriaga of UST were the highest placers, all having 86.40-percent grade. Here's statistics of topnotchers for PNLE in the past three years.